Moxa's ioLogik W5340-HSPA is a wide temperature cellular remote I/O device for remote monitoring applications over mobile networks. With support for the advanced High Speed Downlink Packet Access (HSPA) technology, the W5340-HSPA reduces the response time for I/O status acquisition and control communications. The increased performance also provides enough bandwidth to perform data logging and email alarms. The ioLogik W5340-HSPA is equipped with a cellular interface that supports both five band UMTS/HSPA+ and quad-band GSM/GPRS/EDGE functionality, and features 4 AIs, 8 DI/Os, 2 relays, an Ethernet RJ-45 port, a 3-in-1 serial port, and a SD storage socket. This rich feature set is also available in a rugged wide-temperature W5340-HSPA-T model with a wide operating temperature range of -30 to 70°C (-22 to 158°F) for deployment in harsh environments, such as facilities without air-conditioning or roadside cabinets. The ioLogik W5340-HSPA excels in remote monitoring or data acquisition applications. The I/O suite includes both digital and analogue channels, and can also be externally expanded via Ethernet with the ioLogik E1200 series of Ethernet I/O products (Ten models are available, and four more are in the pipeline). An SD storage function is also available for long-term data log preservation. In addition, patented ‘Active’ communications technology and IPSec/VPN functionality allow easy use of the dynamic and private IP addresses provided by most cellular data plans. 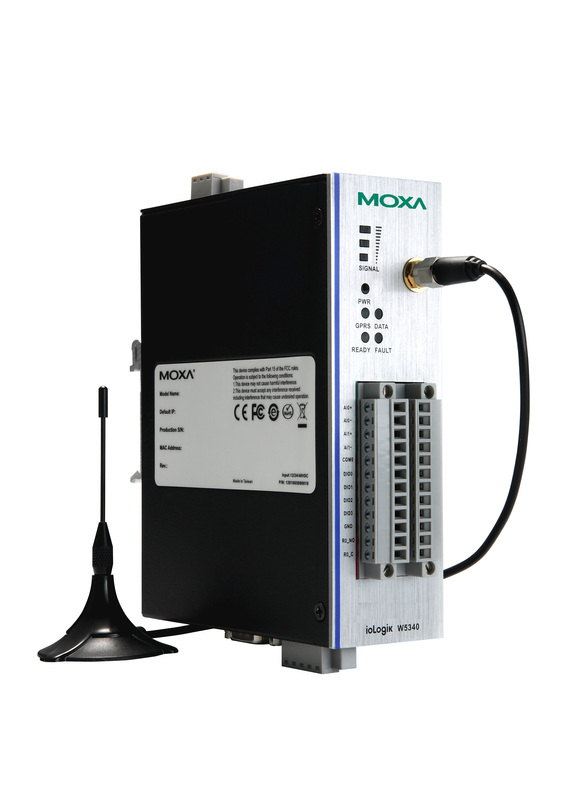 By using active communications, the Moxa Active OPC Server and DA-Center free software packages are also extremely efficient in 'pushing' data from the ioLogik W5340-HSPA to the SCADA system or IT database quickly, without consuming very much bandwidth. Together, the ioLogik W5340-HSPA, Moxa Active OPC Server, and DA-Center deliver highly efficient event-driven SCADA connectivity, database/Excel conversions, and analysis. Moreover, the W5340-HSPA flexibly supports both IT and IA applications thanks to compatibility with the Modbus/TCP industrial standard as well as the IT-oriented SNMP v1/v2c protocol. The ioLogik W5340-HSPA includes Moxa’s Click&Go technology, which makes local I/O control and alarm configuration extremely simple. Powerful features, such as interaction between I/O channels, timer/schedule settings, SMS alarm messages, and TCP/UDP/SNMP traps, can be configured with just a few mouse clicks with Click&Go.